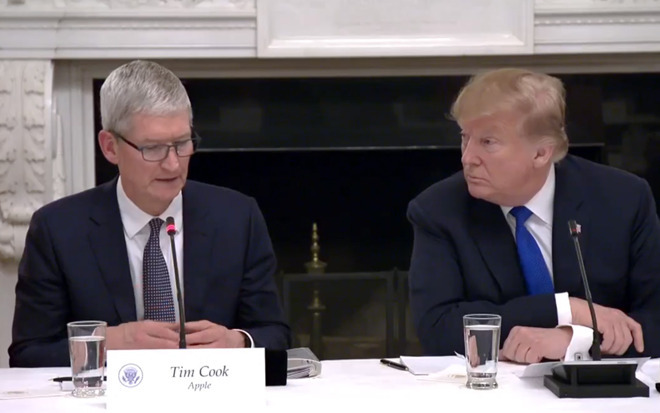 Apple CEO Tim Cook appeared in front of the White House's American Workforce Policy Advisory Board on Wednesday, telling President Donald Trump that a lofty goal of integrating a new nationwide curriculum requires input from the government, private sector, and educators. "As we've looked at the mismatch between the skills that are coming out of colleges and what the skills are that we believe we need in the future — many other businesses do — we've identified coding as a very key one," Cook said. "And we believe strongly that it should be a requirement in the U.S. for every kid to have coding before they graduate from K-12, and become somewhat proficient at it. "And so we've done a [Swift] curriculum now, and provided it to all schools in the U.S.," he continued. "4,000 have picked it up. Now we have a lot further to go because there's a lot more than 4,000 schools in America, but that is a start. We've also done that with 80 community colleges. And we're really proud of that, particularly with the work that we're doing in Austin, and providing coding education there. Cook was named as one of 25 members of the American Workforce Policy Advisory Board on Feb. 13, along with a selection of other executives, education officials, and members of state and local governments. The group met today in Washington, D.C. The board aims to provide varied perspectives on workforce issues that face communities and business, while at the same time working to raise awareness of ways workers can better themselves to create family-sustaining careers. The group will work with the National Council for the American Worker, providing guidance to ensure students and workers can access affordable and relevant education and job training. It will also develop a national campaign to promote education and training, and recommend specific courses of action for improving the labor market to meet the demands of employers, to produce strategies to improve private sector investments in students and workers, and to establish a culture of lifelong learning. "There's an enormous deficit in the number of jobs versus the number of candidates, and so we are proud to take part and to help to get this alignment much better between education and private sector. We realize that in something this large, it takes government, private sector and education all kind of oaring in the same direction, and we're very proud to be a part of it." President Trump was cordial to Cook during the meeting, saying that he'd "done such an incredible job at Apple," employing "so many people" and bringing "a lot of money back into our country because of the new tax law." He even said Cook had "become a friend" of his. It's questionable whether Cook has a genuine friendship with Trump, despite multiple previous meetings. The CEO has regularly spoken out against Trump's policies on matters like immigration, LGBT rights, climate change and Chinese trade. Apple has benefited from lowered corporate taxes, which it used to repatriate some foreign cash and invest in U.S. jobs and facilities.